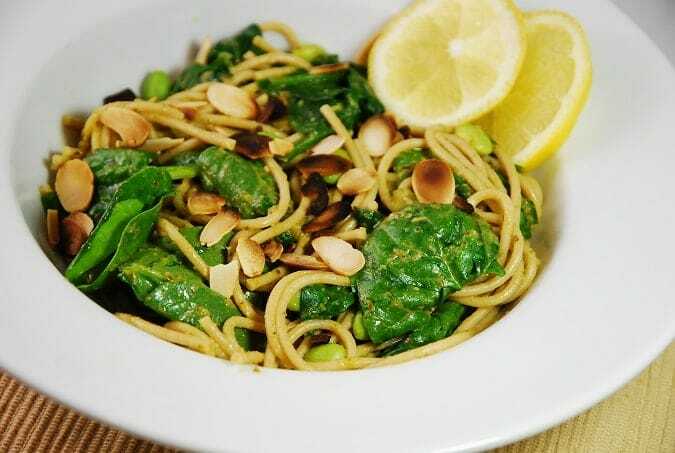 One of my favorite Weight Watchers Pasta Recipes is this incredibly delicious Lemon Spinach Pesto Pasta dish. It is full of healthy ingredients, and the combination of flavors and textures is divine. I always over toast my almond slices a bit, because I like the taste, but feel free to toast yours to your own desired level. The crunch and mild sweetness of the almonds is the perfect compliment to the fresh, lemony flavor of the sauce, and the mildly wilted spinach adds lots of nutrition and volume. This allows allows for the use of less pasta, which helps keep the Points value lower. I use jarred, low-fat pesto because it’s easier when I’m busy. But if you have the time, you can make this dish even less Points by making and using a homemade, low calorie pesto sauce instead. This is one of my go to pasta recipes and the family loves it. And I love that they are enjoying such a healthy meal! Fresh, beautiful and absolutely delicious, this is one unforgettable vegan pasta recipe. The amazing list of healthy ingredients provide bountiful amounts of protein and fiber leaving you full and satisfied that is as scrumptious as it is nutritious. Prepare pasta according to package directions. Drain and return to pot. Stir in spinach, cover and to allow the warm noodles to slightly wilt the spinach. Let sit about 5-10 minutes. Meanwhile, place a small, nonstick skillet over medium high heat. Add in almonds and toss frequently until desired level of toasting is reached, typically about 3-4 minutes. Add edamame, pesto, lemon juice and salt and pepper into the pasta and spinach. Toss to combine. Divide evenly into 4 serving bowls, and top with toasted almond slices. Absolutely fabulous. I did substitute frozen chopped spinach (cooked) but I want to try it with fresh spinach or chard next time. Thanks! Lemon and toasted almonds make it REALLY special as well as the edamame.